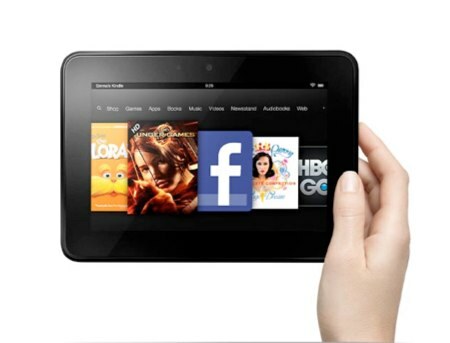 Amazon released its new line of Kindle Fires recently, and a mob of pitchfork-wielding villagers are furious that the least costly model features ads on the unlock and home screens. This move had been rumored for a while, so it really wasn’t a shock to me. In fact, if done properly, this could have been a really great thing: a way to reduce the price of tablets to make them more affordable for younger customers, students, or lower-income families (or school boards). This is a particularly important move if tablets are, in fact, the way the textbook market will eventually shift. In practice, I’m not sure that was how things actually worked out. Apparently the convenience of not having ads on your device is only worth $15—not enough to make much difference for low-income families, but maybe enough for a significant difference if purchased in bulk by a school district or university department. At this point, the textbook market has a long way to go in improving digital availability before academic distribution is a legitimate argument for the ads. And, perhaps, the ads aren’t such a big deal anyway and this is all just much ado about nothing. Terrific new media, new and old, that we’re particularly enjoying. Spectacular Twitter fiction from Jennifer Egan, impinging on the world of her novel,A Visit From The Goon Squad. Simon Christiansen’s brilliantly clever interactive fiction. Christine Wilks’s Out of Touch is an exploration into loneliness and the fetish (and artifice) of human connectedness inherent in social media, a theme to which many of us can relate. Andrew Plotkin’s iOS implementation of Jason Smiga’s interactive comic. by Mark Wernham. Machine #69 recalls Ryman’s 253, and especially Bob Arellano’s Sunshine ’69 both in its embrace of arbitrary connection and its fond nostalgia for the era when cheap booze, good drugs, fast cars and hot guns seemed to offer everything worth wanting and when nothing was worth wanting very much. by Michael Joyce. The first great hypertext fiction, a landmark that repays close study. A new hyperromance for the Web. Sparsely linked, La Farge’s new hypertext nods at Stephanie Strickland’s design and to Michael Joyce’s direct address to the reader. but brings a new voice and sensibility to Web fiction. 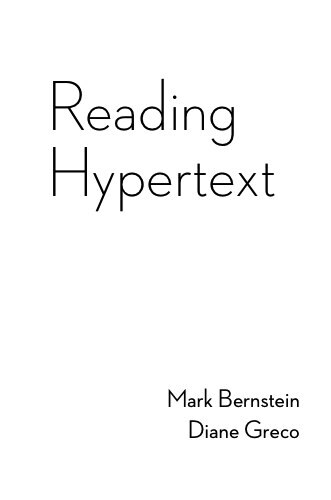 Key readings about Reading Hypertext, edited by Mark Bernstein and Diane Greco. Just published by Eastgate; $39.95. Please follow htlit on Twitter.